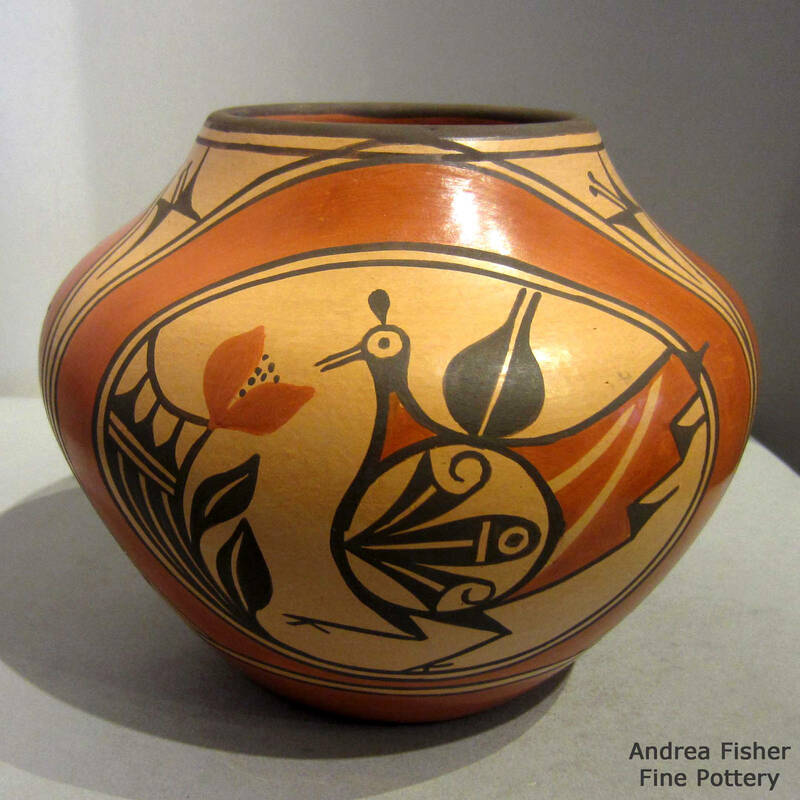 Among Native American people symbolic imagery is extremely important to the continuation of traditional beliefs. Archaeologists have demonstrated that the marks made on pottery are very much like ancient wall paintings that have long outlasted their creators. The Native American view that all things, living or inanimate, posses a spirit is what drives this language of symbols. The symbols of nature represent the importance the elements hold for human life and existence. 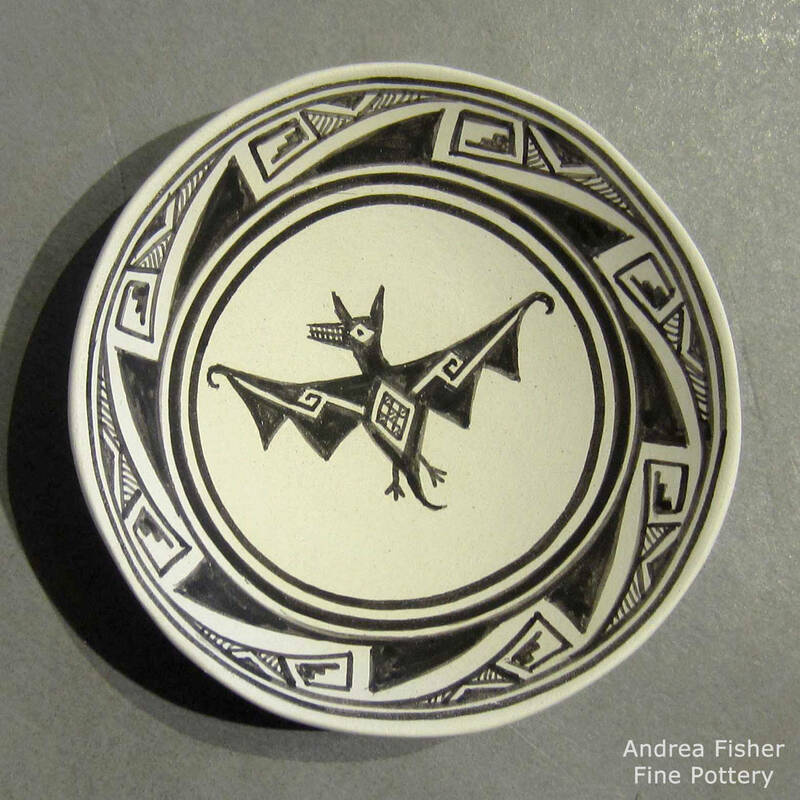 Certain qualities and characteristics are represented by animal symbols. 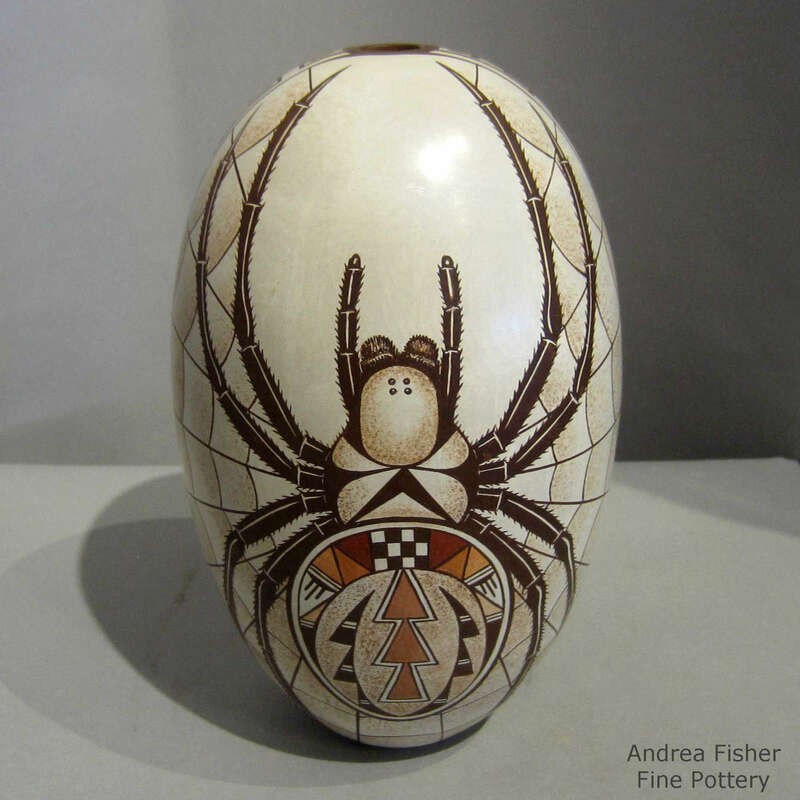 Hatching and geometric lines that may appear to be solely decoration often represent abstract ideas. 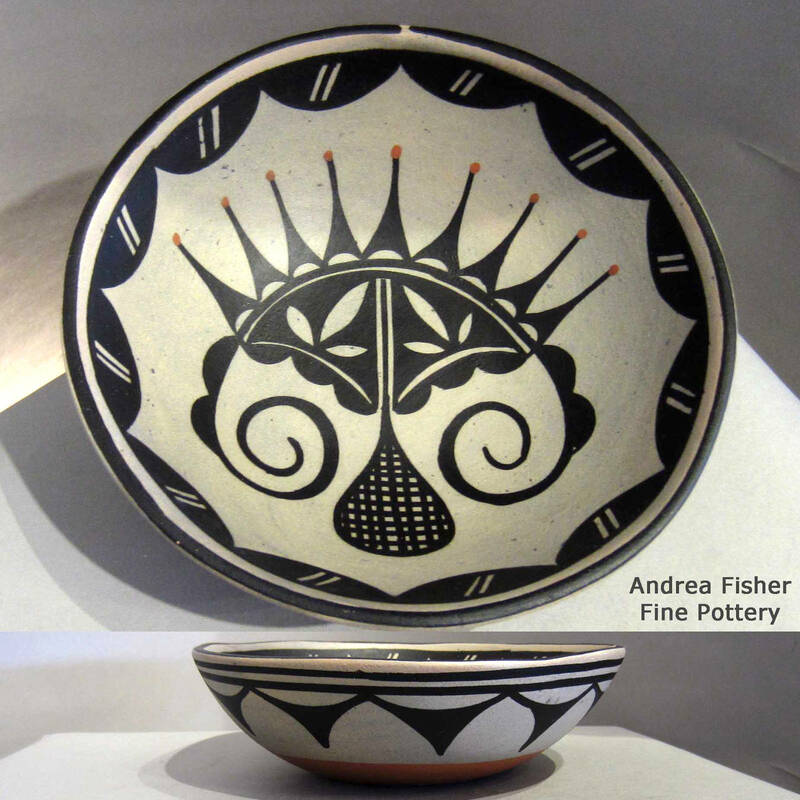 Among the common themes of Pueblo imagery are symbols of nature and spiritual beliefs. 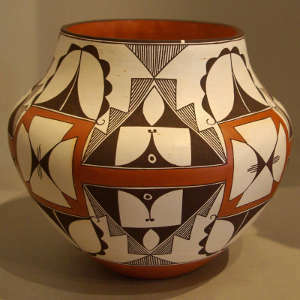 The vast majority of symbols and designs in common use among pueblo potters are copies (or stylized interpretations) of symbols that have been found on pottery shards that are, in some cases, hundreds of years old. Arrows: Arrows usually imply force, movement, direction and power. When displayed within a landscape they imply direction. When displayed with animals they represent the "heart line" which shows the pathway of breath or the life-force of the animal spirit. When an animal is shown with an arrow going inward, it represents a prayer for better hunting. 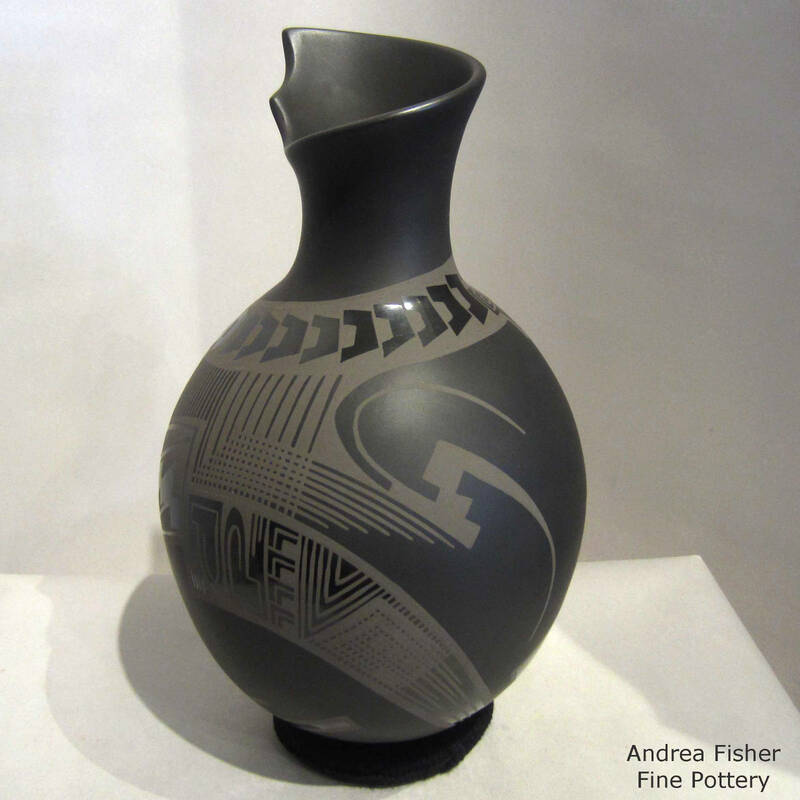 Lines: Hatched lines usually indicate movement or rain. Rain translates to fertile land and represents a necessary vital life source. There are many motifs that imply prayers for rain and water. Other parallel lines may represent crop rows. 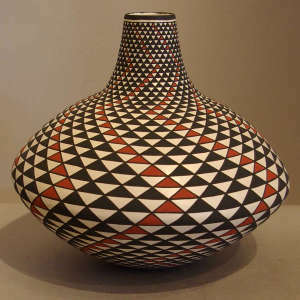 Horizontal lines can be decorative or might depict the horizon. Diagonal lines might indicate the journey of a spirit between worlds. 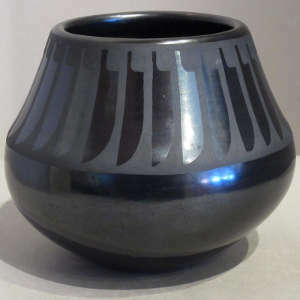 Lines that encircle the rim of a pot sometimes have a gap, or "spirit break," which metaphorically releases the spirit of the potter or any other spirits that may be associated with the materials that make up the pot (some potters use ground up pot shards for temper and everything about it implies the presence of the spirits of those former potters, too). Circles: Circles might represent the earth, the sun or the moon. Symbols in which circles are juxtaposed with diagonal lines signify the movement of the sun and specific times of day or year. Pueblo Indians tell time by the position of the sun and have carefully mapped its motion. Certain positions of the sun mean the beginning and ending of duties like planting and harvesting as well as when to perform ceremonies. Concentric circles might represent levels to the Upper World. Kiva Steps: The Kiva is an underground ceremonial and religious structure. They usually have a hole in the center to symbolize the sipapu where the ancestors originally emerged on the surface of this world. The steps symbolize man's journey from the three levels of the underworld to the upper world, as described in the Emergence Myth. Steps are sometimes cut into the rim of a pot, too. Spirals: Spirals represent renewal and continuation. They might also represent a spiritual journey to other worlds or the broadening of one's consciousness. Avanyu: Avanyu is a mythical water serpent who is believed to bring storms and sudden change. He is valued for bringing water to the land especially in seasons of drought. 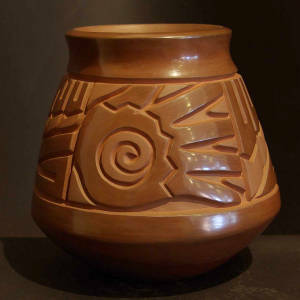 Avanyu is depicted on many Santa Clara and San Ildefonso pots. Bear Paws and Deer Tracks: Paw prints and tracks indicate the presence of the animal spirit. Bear paws are a symbol of authority, strength and leadership. Deer tracks are used to show direction and are used in pictorial story telling. Grouped animal tracks represent kinship. Animals in pairs symbolize devotion and permanence. Cloud Eater: The Cloud Eater is usually pictured as a large bird that is swallowing fish, with a couple fish usually stuck in its throat. Often surrounded by symbols of rain, the Cloud Eater seems to be a uniquely Mimbres-derived symbol. Feathers: Depicted in many different ways, feathers are symbols of honor and the creative forces. They have many ceremonial purposes and are used on arrows and prayer sticks. 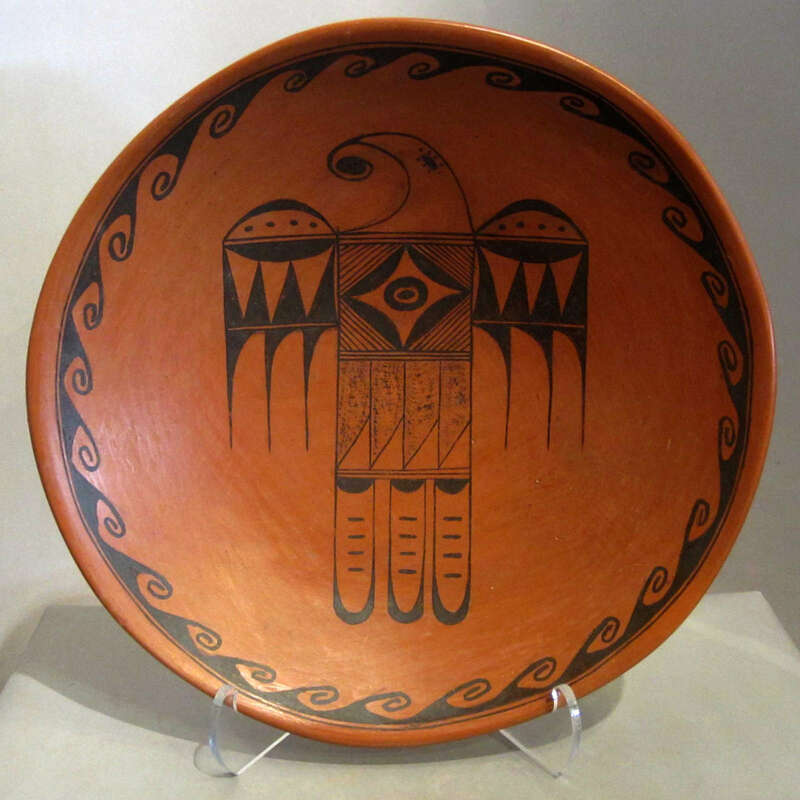 Circular feather arrangements ring many pueblo pots and plates. Handprints: Represent the presence of humans, their work, their achievements and history. Kokopelli: A mythical flute player prevalent in Southwest design. His image is found on rock art almost 2,000 years old and still appears on pottery today. Kokopelli is a very male symbol and also represents the fertility of the lands. 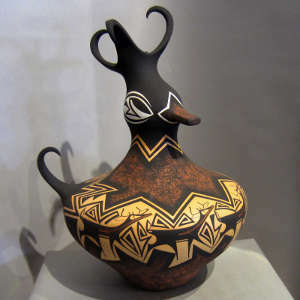 The name Kokopelli may have derived from Zuni and Hopi names for a god: Koko, and a desert fly: Pelli. He sometimes resembles an insect, usually a cricket. He has also been referred to as a seed-bringer and water sprinkler. Zia: The Zia is a sun symbol first used by the people of Zia Pueblo. When New Mexico became a state in 1912, the Zia was taken as the symbol for the state flag. It is also sometimes seen as a cross with four directions. 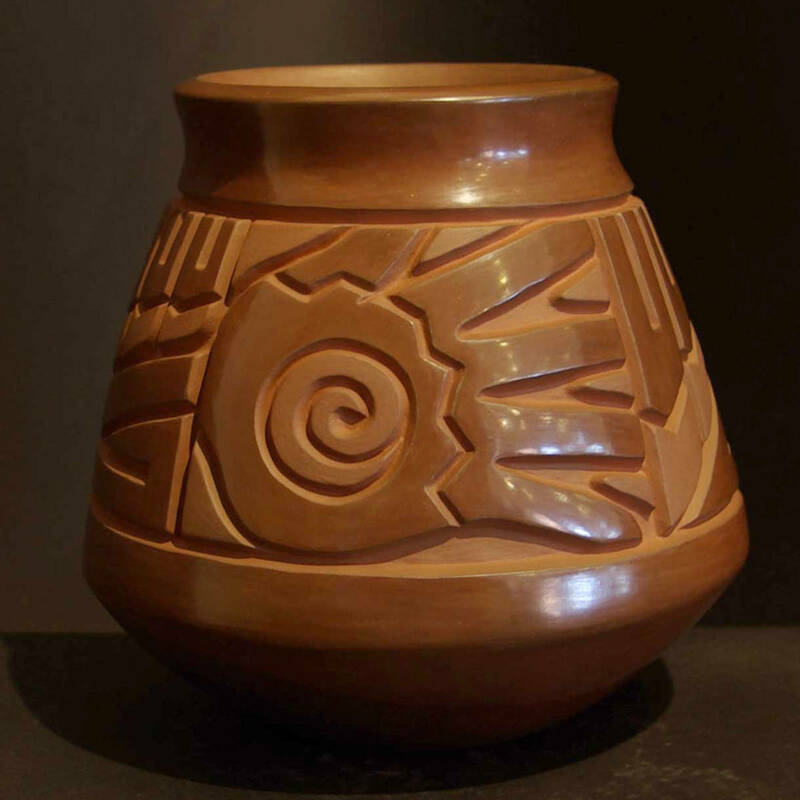 The number four is sacred to many Native American groups as it embodies the powers of nature: the four directions, four seasons and four ages of man. It is a symbol of balance. 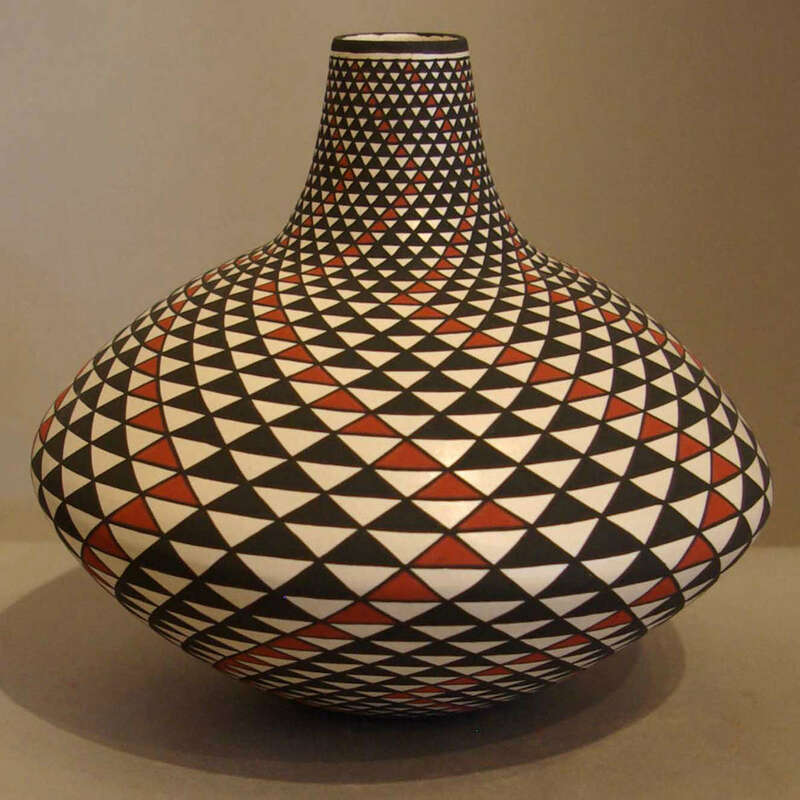 Hopi Sun: The sun is seen as the source of life and tied to the Creator. Clouds: Clouds are usually illustrated by stepped lines that are often shown with symbols for rain and lightning. Corn: Corn represents the primary staple of life. It is the symbol of health, happiness and fertility. 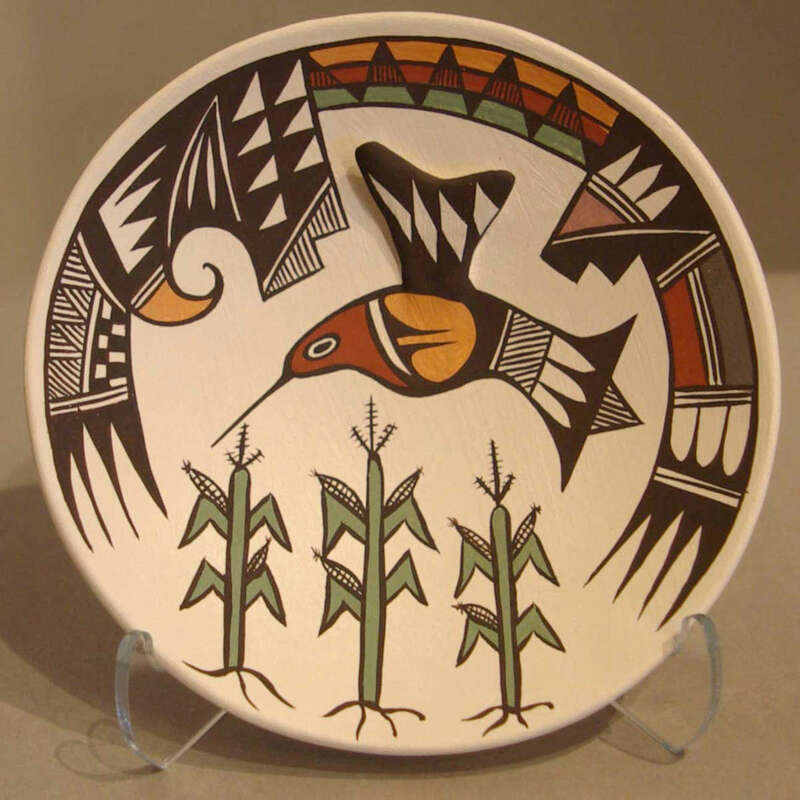 A great many Native American potters are members of the Corn Clan, too.